Perfume Blogger Interview with Gaia of “The Non-Blonde”! As far as I’m concerned, The Non-Blonde is the ultimate authority on oriental and woody perfumes. As an oriental fragrance-loving lady myself, it has quite literally been years since I have not wholeheartedly agreed with one of Gaia’s reviews. Gaia has been one of the most consistently excellent perfume bloggers since 2006, and she does it all with eleven cats. The adorable one pictured here is Lizzy. For the same reason I write about lipstick, Kim Kardashian and fashion trends: I have something to say and I can’t keep my mouth shut. Of course, I have a certain passion for perfume and a need to share it. You’ve revealed on The Non Blonde that one of your very first fragrances was the squeaky-clean white floral Calvin Klein Eternity. Considering that you are now such an aficionado of oriental fragrances that you refer to Serge Lutens as “our favorite Uncle Serge”, what has caused your perfume preferences to change so drastically over the years? At first I was going to say that perhaps my taste hasn’t changed so much as it expanded. But who am I kidding? While I keep some vintage Eternity around for reference and sentimental reasons (and also White Linen, that I wore around the same time), I can’t bring myself to wear either one. They really rub me the wrong way these days. But back to the original question, it has a lot to do with exposure and availability. Remember that we’re talking about the late 80s and very early 1990s, before Uncle Serge, Uncle Freddie and the rest of them. White Linen and Eternity were among my everyday scents because they were accessible, but at the same time I also wore Sisley Eau du Soir, Sonia Rykiel Le Parfum, the original Tiffany, Valentino by Valentino and Paloma Picasso. Not so squeaky clean, after all. Oh, boy. Too many for my own good: Serge Lutens, Tauer Perfumes, Mona di Orio, Gueralin, DSH Perfumes, Annick Goutal, JAR, Parfum d’Empire, Vero Profumo, MPG, Aftelier, Parfumerie Generale. Henri Bendel and MiN NY, Luckyscent, Beauty Habit and nothing beats a good deal on Parfum1. In addition to perfume and makeup reviews, you often post delightful critiques of celebrity fashion. Your style nemesis seems to be Kat Von D, who you dryly declare “a glamorous embodiment of class and good taste”. Have you tried any of Kat Von D’s perfumes? Are they as appealing as their namesake? I never got around to trying her perfumes. I was highly unimpressed with her makeup so I was never moved to see what else she has to offer. I have a house full of cats, so that probably qualifies as a major interest. I love antiquing: have a thing for Art Deco and mid-century modern items. I love reading; I resisted digital books for the longest time but I’m a believer now. It’s the best thing since the Internet. The ever-expanding wishlist includes Pandora by DSH, JAR Golconda, Mona di Orio Vanille and lots and lots of others. 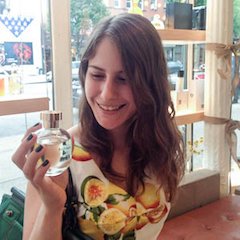 ‹ PreviousPerfume Blogger Interview with Nick of “Fragrant Reviews”! Next ›Perfume Blogger Interview with Thomas of “The Candy Perfume Boy”! It seems that cats are fumeheads’ second addiction. I hope you find everything you wish for under your tree Gaia. You have expensive taste from what I can tell so it’s only fair you get a little Santa endorsement. I’ve tried exactly one Kat Von D perfume, Sinner, and it was one of those VIB perks from Sephora. It smells like patchouli. Reminds me of a cheaper less complex Midnight Poison. Would not recommend. 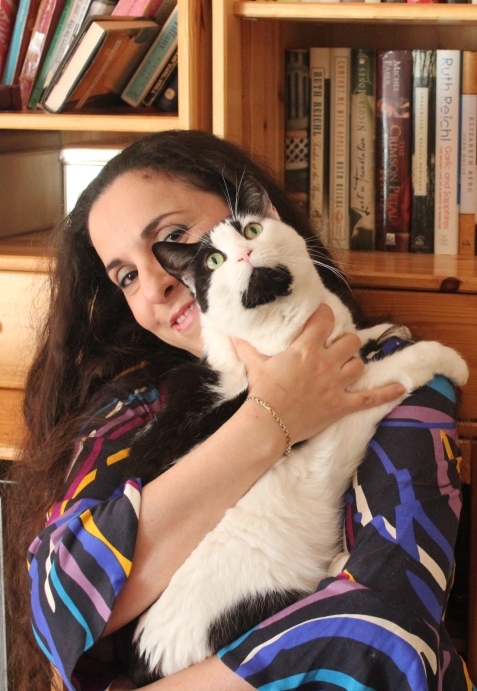 What a delightful interview of my friend Gaia! She’s really a smart, opinionated cookie and that’s why we love her. Interesting questions and lovely, honest answers, Thanks to both of you! I found out yesterday on Twitter that Gaia and I both love perfume, makeup, cats, chocolate, and tea. Quite a list in common 🙂 Great interview – thanks Ari! I love these interviews. Thank you, Ari and Gaia! Rock with you, Gaia! I’m unconditional reader since long time ago and never said a word … You the boss girl! I love the snarky side to The Non-Blonde too and am in awe at the quality of your cosmetic close ups. I’m really curious: why eleven? Thanks, everyone! You’re all so kind. And many thanks to Ari for finding me worthy of an interview. I’m probably not the most typical crazy cat lady– I don’t own any appliqued cat sweaters. But the critters are a big love, as is probably obvious. Why eleven? Because I can, most likely. The husband and I adopt strays and shelter cats; somehow over the last couple of years when we lost two of our oldest cats we found ourselves adopting them in pairs (Josephine & Sophie, Cedric & Olivia), so that boosted the numbers a bit. You’ve interviewed two of my closest “scent twins” – Gaia/The Non-Blonde and Angela of NST. I always take heed of whatever these two oriental-loving ladies have to say. Thank you an amazing put up, may eximane your personal others posts. thanks for your ideas for this, I experienced a bit made an impact to by this text. Thanks again again! You earn a good time. Displays the beauty through excellent report here. I do think that if a greater number of people considered it that way, they’d have a better time period receive the hold ofing the matter.